Question: Every spring when the carp are spawning, I see them very active, often jumping out of the water entirely. So I’ve been trying to catch one, but the water in the river I’m fishing is very muddy, and sight-fishing is impractical. I’ve read enough articles online and discovered a few tricks used to spot them. I can now see non-static bubbles created from carp feeding on the bottom, yet I have only seen one carp that was not jumping out of the water, by accident in less than two feet of water. I tried catching one using nymphs and small crayfish imitations for many consecutive days when I’m pretty sure I’ve seen signs of their presence, but nothing. Are carp so hard to catch? Can I do anything better to improve my odds of catching one someday? Answer: Here’s the part where I’m forced to admit that I have never caught a carp on a fly. However, one of my few attempts mirrors Nicolas’s experience. I had moved to North Carolina and, while driving past a pond, had seen carp rolling and jumping. I ran home, got my gear, and fruitlessly cast for a couple hours. When I got home, I called John Likakis, former editor of Warmwater Fly Fishing, and asked him what was up. He said, “You can’t catch those fish. They’re spawning, so they’re not interested in eating at all. Plus they’re constantly on the move.” Instead, he told me to look for fish that are actively feeding or cruising in clearer water. 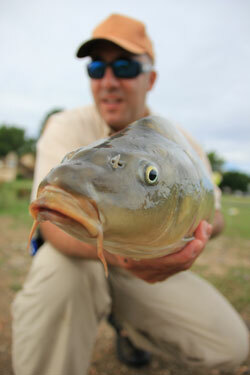 “Carp are not difficult to catch, if you know which fish to target and when. Spawning fish, jumping out of the water and wallowing in the shallows, are not the ideal choice for the fly angler. Setting aside the ethical issue of fishing to spawners, these fish have one thing on their minds, and it is not eating. However, it is hard to ignore these fish, and I have tried in the past to catch them, but have snagged many more than I have caught. I would recommend that you wait it out and let the fish do their thing. As the water warms and the summer progresses, the spawn will wrap up, and these fish will resume more ‘normal’ behavior. I like to target fish that are actively feeding, noses in the mud and tails up near the surface or even out of the water. These are the fish that will eat a fly, often with reckless abandon. In general, early and late are the best times, but don’t discount the middle of the day. Days with little to no wind and good light are ideal, as this is more like hunting than fishing and the ability to spot and stalk fish is imperative. Be cautious and move slowly; these fish are often in very shallow water and will flee for deeper water at the slightest sense of danger. A good pair of polarized glasses is a must. Keep in mind that a fish in shallow water is often there to feed. Carp are opportunistic feeders and will take advantage of many different food sources. Obvious starting points are smaller crayfish patterns and Woolly Buggers. Be sure to give the fly plenty of time to sink to the bottom before the fish gets to it, or the fly gets to the fish. Retrieve it or dead drift; let the fish’s reaction be your guide. Small nymphs are also good choices, and don’t rule out using a strike indicator if you can’t see the fish clearly in muddy water; just keep the indicator small and light.